“Clearly, African cinema, too, like African political leadership, cannot hope to advance without the presence of women on the scene…. Sembène was considered a significant feminist… But even his films will not be satisfactory… until we have affirmative action in Africa to include women in politics, in classrooms, in film schools, and in every other sector of life.” (Diawara, 2010: 161). With the foregoing words, halfway through his most recent book, African Film: New Forms of Aesthetics and Politics, Manthia Diawara addresses, with the requisite degree of grace and political correctness, one of the most glaring deficiencies in the cinematic production of the continent: the continuing inequality between men and women. It seems probable that, in the final moments of editing and proofreading the text, the numerical scarcity of female directors analyzed, or at least mentioned, compelled the author to insert, by way of a mea culpa, a few paragraphs indicting a critical status quo that has yet to accord women their proper place. The numbers do not lie: of the 31 films selected by Diawara for the African Film series sponsored by Berlin’s Haus der Kulturen der Welt, which resulted in the publication of Diawara’s book and its accompanying DVD, only four were directed by women, and one can hardly fail to notice the paucity of analysis these receive in comparison to the detailed attention given to the woks of Ousmane Sembène, Abderrahmane Sissako, Jean-Pierre Bekolo, and Moussa Sené Absa. 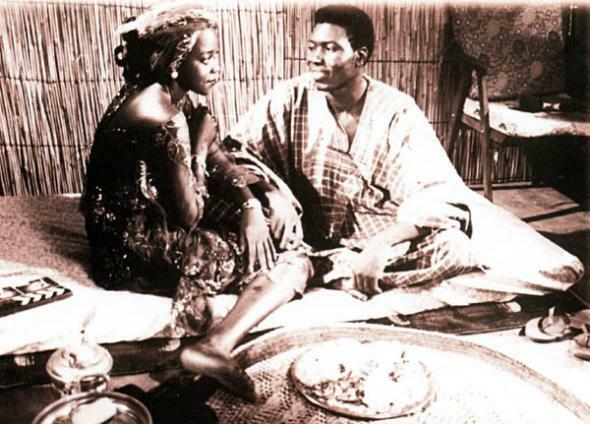 It can be argued that the proportion is representative of African film production as a whole; nevertheless, the gap in Diawara’s study, and his subsequent apology in extremis, speak unmistakably of the reality of women in African cinema today: a constant quest for recognition that arrives, if ever, on the heels of that of their male counterparts, less as a result of their own achievements than of the ascendancy of politics promoting the broad recognition of minorities as a principle in itself, which in their generality want for the kinds of theoretical and critical analyses necessary to rectify women’s subordinate position. The skepticism generally warranted toward avowed efforts to recognize women’s equality is particularly justified in the case of cinema, where the tendency of such normally emphasizes the links between their production and traditionally feminine themes such as education, health, childhood, the fight for equality, and so forth, all of which impedes the possibility of their being considered as cineastes, on par with, and to be critiqued in the same way as, their male contemporaries. As a final excuse, many critics and film theorists, stressing the greater necessity of giving due legitimacy to African film within the wider world of film studies, deem an analysis of the situation of its female directors a secondary issue, to be dealt with in time. Yet it is reasonable to ask whether the legitimacy of African film as such can be established on the basis of a distorted image of its nature, let alone whether it is ethically or esthetically justifiable to postpone a conscious reckoning with the real place of women in African cinema. Les Oubliees, directed by Anne-Laure Folly, 1996. Any attempt at vindication of said place must begin with an esthetics equally applicable to male and female filmmakers and must dispense with the notion of alleged feminine virtues to be contrasted with masculine ones. For this task, the perspectives of occidental feminism are problematic and perhaps inadequate, to the extent that this discourse has never entirely extricated itself from a broader philosophical tradition linked to colonialism (Sohat, 1993: 42). In the words of Melissa Thackway: “[T]he dominant male/subjugated female psychoanalytical paradigm may inadequately describe or actually mask the oppression of women in other cultures whose condition is often equally affected by other factors, such as ethnic origin, class, sexual preference or history” (Thackway, 2003: 148). It is even contended, among certain African feminists, that the oppression of women in Africa is a relatively recent phenomenon, arriving on the continent with the respective proselytizers of Christianity, Islam, and capitalism, which suppressed native matrilineal traditions in which women were accorded great respect and power. Distinction of gender roles is evident neither in the traditional pre-colonial narratives nor in the liberation movements of the various African nations; thus, the situation of the African woman cannot be equated with that of the western, but may be better described as an “equality of difference,” in the words of the Cameroonian writer Calixthe Beyala, among others. In any case, an indictment of those prejudices that sustain the subaltern position of women, be they native or imposed from without, must take as its basis the testimony of these women themselves, and the fundamental task is less one of fabricating critical perspectives than of opening up spaces in which their voices can be heard. Among specialists, there has been a growing acknowledgement of the essential role women have played in African cinema since its origins. Nevertheless, international recognition has been lacking until quite recently. The reasons are various: inequality of access to education, and, in consequence, reduced possibilities for entry into the labor market; the precariousness of film production in Africa in general; the vagaries of western tastes, which have tended to push women aside in favor of, on the one hand, purveyors of blockbusters and on the other, a handful of auteurs, generally male, who direct from the artistic and geographical periphery and whose presence in the international film scene lends artistic gravity to a basically banal enterprise; and finally, the preeminence granted to directors of full-length fiction films, because of which an enormous array of talented women working as producers, scriptwriters, actresses, technicians, documentarians, and festival organizers has been overlooked. That it should only be possible to trace the work of a half-dozen female directors in the secondary literature concerning African cinema confirms the continuing bias, in the west, toward film and toward a politique des auteurs which, despite its artistic pretensions, should be understood less as a promotion of creative independence and more as a commercial strategy involving the conversion of recognized directors into commodities. Even as digital technologies have permitted a democratization of access to the process of filmmaking, the enduring distinction between high and low art, with the implicit relegation of video and digital to the latter, has impeded a critical appreciation of numerous areas of production in which women are more active, particularly the short and medium length documentary pieces, often made for television, which form a refuge for many female directors hoping to move on to more ambitious full-length fictional productions. Likewise, in genres such as melodrama, animation, and science fiction, normally accorded lesser consideration, women have produced works of great note which, if they have attracted relatively little critical attention, have nonetheless had a greater impact on their viewing audience than the more highly regarded cinema d’auteur. To give these works their due is not to advance a minority-studies approach to African cinema, but rather to give a fuller and more realistic picture to the audio-visual production of a continent whose output has too often been reduced to the works of a coterie of grands hommes exhibited in film festivals where, once again, women have gained very little traction. Fanta Régina Nacro.This is particularly important insofar as the profusion of African film festivals that has arisen in the previous decade has proven to be one of the few viable avenues for the distribution of these works, especially given the shuttering of cinemas across the continent, at times for political reasons and at times for economic ones1. The pressure, often subconscious, to conform to the expectations of the Western cinephiles and critics whose role is essential to these festivals, has been denominated “festivality” by the critic and director Férid Boughedir, and is the subject of important work by the Ivorian professor Mahomed Bamba (Meleiro: 77-104). The African woman has found herself in an ambivalent position: lauded on the one hand, as symbol and even subject, in the works of the Senegalese pioneers Ousmane Sembène and Djibril Diop Mambety and of the Malinese Souleymane Cissé; on the other, disparaged in terms of her actual production. This is illustrated clearly by an examination of the two most important African film festivals celebrated on the continent, celebrated every two years in Carthage and Ouagadougou. The grand prizes for both events are named for mythical female figures—the goddess Tanit and the princess Yennenga, mythic, pan-African symbols of strength and valor, whose ideal character is echoed in the utopian strains of the first African filmmakers in their quest to construct an imaginary for the newly liberated nations. This only serves to underscore the relative absence of female prize-winners. In Carthage, Sarah Maldoror—from Guadalupe, but African with respect to her motivation and themes—won the Tanit d’or in 1972 for Sambizanga; more than two decades passed before the prize was awarded to a woman again, this time to Moufida Tlatli for Les silences du palais. Safi Faye’s Tanit de bronze for 1980’s Fal ‘jal seems almost incidental. And yet, few as these concessions are, they are triumphs in comparison with the disdain evident at FESPACO: not once has a women proven deserving of the Étalon d’or. Safi Faye did merit Special Mention in 1976 for Lettre paysanne and, in 2001, in the 17th installment, Fanta Régina Nacro was awarded Best Short, for Bintou, following this up with Best Script in 2005 for La Nuit de la Vérité. The possibility of change is discernible in the most recent two installments: in 2009 the documentary awards were swept by three female directors, Leila Kilani (Nos lieux interdits), Jihan el-Tahri (Behind the Rainbow), and Osvalde Lewat (Bad Business), and in FESPACO in 2011 women won in several important categories: The Oumadou Ganda prize for first feature went to Sarah Bouyain for Notre étrangère; Best Documentary to Jane Murago-Munene for Monica Wangu Wamwere; and the Special Jury Prize was granted to the short film Tabou by the Tunisian Meriem Rivelli. 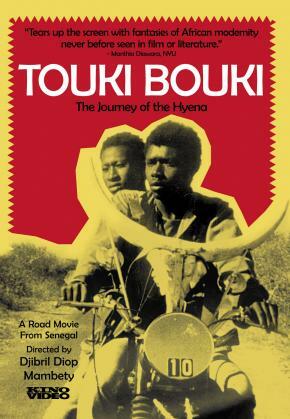 Touki Bouki (or Journey of the Hyena), directed by Djibril Diop Mambéty, 1973.It is nevertheless important, without aspersing the accomplishments of these directors and the significance of their awards, to make note of the recent criticism leveled at FESPACO by Mahamat Saleh-Haroun and Jean-Marie Teno, among others. Since its early days, the festival has been marked by disorganization and unpredictability; these traits have grown more salient as it has been forced to compete with similar events both inside and outside of Africa, many of them with better resources than those available in Burkina Faso. Yet this alone does not explain adequately these directors’ promised absence from future installments of the festival. Is it not rather a case of brighter shores beckoning, and of women, once more, taking over positions no longer of interest to their male colleagues? If not, how should one explain the triumphant debut of Un home qui crie in Cannes? In time, it is to be hoped, there will evolve genuinely African resources for the production, distribution, and exhibition of African cinema within the continent; until that time, the industry largely depends on film festivals for its survival. Here again, the influence of women, though little documented, has been decisive, particularly in Europe and North America; meriting particular mention in this connection are Mahen Bonetti, director of the African Film Festival in New York; Alessandra Speciale, since 1991 artistic director of Milan’s African film festival and chief editor of Écrans d’afrique; the numerous contributions of women working with Vues d’Afrique in Montreal; and the work of Mane Cisneros and Marion Berger in the Festival de cine africano in Tarifa (Spain). 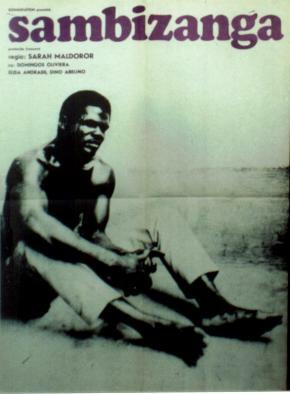 Sambizanga, directed by Sarah Maldoror, 1972.Although still minuscule by scholarly standards, the body of work concerning the representation of women in African cinema has experienced a veritable explosion since the 1990s, above all in Europe and North America. It may speak of a certain feminine solidarity that the majority of research concerning this theme have been brought to fruition by women (Thackway, 2003; Coletti, 2001; Ellerson, 2000; Foster, 1996). In earlier general studies, the names of the groundbreaking directors Safi Faye and Sarah Maldoror were often to be found alongside those of their male compeers; later, they would be joined by Anne-Laure Folly and Fanta Regina Nacro (Diawara, 1992; Ukadike, 2002; Pfaff, 2004; Murphy and Williams, 2007; Armes, 2007; Arensburg, 2010). This remains inadequate. Underlining the still-pending necessity of according proper place to female directors, without lapsing into the vitiated paternalism represented by third world feminism, Kenneth Harrow, in his indispensable “Women with Open Eyes, Women of Stone and Hammers: Western Filmmaking and African Feminist Filmmaking Practice” emphasizes the necessity of a truly subversive idiom to the transcendence of those masculine conventions—part of a still regnant ethnographic discourse irreversibly vitiated by eurocentrism—still present in much of women’s contemporary production. A cinema of opposition cannot be called such if its adoption of putative women’s themes is subjugated to the perennial authoritarian gaze, the cardinal characteristic of which is the erection of a hermetic symbolic order codifying the distance between the creator and the reality represented. We should look rather to the destabilizing effects of soundtrack, the fragmentation of the image sequence, or even to the inclusion of the director as an active participant, stripped of neutrality, in her own work, as the most fruitful avenues for any oppositional cinema hoping to challenge the tyranny of the western cinematographic language. It is in this connection that Harrow decries the “strong current of African feminist filmmaking, from Safi Faye to Sarah Maldoror to Anne-Laure Folly, that reaffirms its own mainstream cultural norms by adopting a cinema of vérité, of truth, of one truthness, of representation […] women joining the exclusive male club, not disrupting the established order […] adopting mainstream anthropological film practices and presuppositions” (Harrow, 1999: 23). Harrow’s indictment, while astute, required qualification: first, as it smacks of an ivory-tower elitism that disparages traditionally minor genres as a mode of mass-indoctrination unsuited to deeper analysis; second, as it ignores the constant compromises and negotiations that form the very fabric of the filmmaking enterprise. If the works of the directors in question do not represent radical formal or thematic ruptures, their tenacity no doubt laid the groundwork for the much more daring works on offer today. Furthermore, it is impossible to ignore the economic and political realities in thrall to which, for many female directors, documentary and television have proven more practicable options. It is rewarding to consider the careers of these female directors alongside those of female writers, though with a necessary caveat: the individual nature of literary production has allowed it to achieve a level of innovation and subversion to which cinema, because of its complex and cooperative character, has only arrived later. When the first books by African female authors began to appear in the 1970s, their works served as a corrective to the image of women put forth by male authors for nearly half a century—an image of a largely symbolic nature, integrated into a generalized discourse concerning African liberation from the yoke of imperialism, “tied above all,” as Coletti has noted, “to the myth of the mother and to the exaltation and veneration of feminine fecundity” (2001: 31). “Mother Africa” served as the hallmark of an idealized past, her beauty, selflessness, and bravery of a utopian character. It was through autobiography, in the 1970s, and later in works of variegated structure, that women reclaimed their voice; not rejecting the above-mentioned virtues, but integrating them into narratives with women at the center, rather than the periphery, and blending the formal aspects of oral tradition with a new critical consciousness. It is at this point that one can speak of the “new, uniquely feminine African novel, signifying a powerful transformation under the sign of subversion” (Cazenave, 1996: 334). African cinema arose with the wave of independence, beginning as a (re)construction of the history, culture, and identities that had suffered under the yoke of colonialism. The medium’s didactic possibilities appealed to many writers frustrated by the enormous prevalence of illiteracy in their home countries, and the early films are thus inflected with a literary sensibility strongly influenced by oral traditions. At this time, art served to define the specificity of national cultures and as an indictment of inequality, corruption, and social injustice, and women were present as types, symbolizing heroines or victims, or else confined to their own spaces—the courtyard or reunions for traditional celebrations—but in any case, deprived of their own voices, save for the occasional ruptures of traditional music and dance that stray into a more ambiguous cinematographic territory. 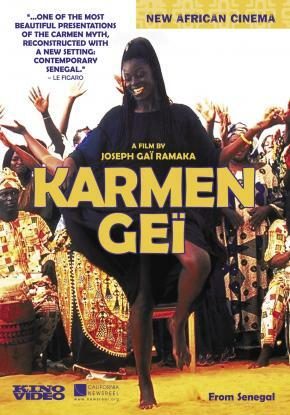 Karmen Gei, directed by Joseph Gaï Ramaka, 2001.Though Ousmane Sembène, Djibril Diop Mambety, Cheick Oumar Sissoko, Med Hondo, and Adama Drabo have indeed presented more complete representations of women in their works, they cannot be said to have freed themselves entirely from the notion of woman as archetype. It is only later, in the production of Abderrahmane Sissako, Moussa Sené Absa, Jean-Marie Teno, Joseph Gaï Ramaka, and Jean-Pierre Bekolo, among others, that the complex task of rendering flesh and blood characters, multidimensional in terms of their motivations, is taken up with seriousness. It would be excessive to list the numerous recent efforts to broaden and enrich the image of women in contemporary African cinema, but the following examples should be mentioned: Madame Brouette (Moussa Sené Absa, 2003), Nha Fala (Flora Gomes, 2002), and Karmen Gei (Joseph Gaï Ramaka, 2001) and U-Carmen (Mark Dornford-May, 2005), both adaptations of Bizet’s opera Carmen. In all of these, women are unarguable protagonists. Still, the themes they extrapolate, by means of musical and melodrama, represent a departure from the situation of the contemporary woman in Africa. Their identification of women with the voice and particularly with music represents a reemergence of the idealization of the feminine seen in earlier films, though at present the more current themes of urban reality are stressed. The innovation of these films lies not in their still stereotypical understanding of women, nor in their visual representation of them; it is rather in terms of form, of the new possibilities that the increased emphasis on music in them presents. They offer a vibrant alternative to the previous wave of cinema, largely characterized the exaltation of the rural, of traditions and their recuperation, and of a specific kind of narration, slow and measured, based in oral conventions in which silence and speech were equally stressed. If melodrama and the musical have yet to present us with images of women completely in the round, their form—dynamic, irreverent, and entertaining, combining elements of satire, drama, puns, and the carnivalesque—holds promise of doing so. 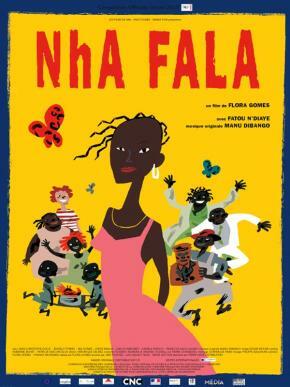 Nha Fala, directed by Flora Gomes, 2002. 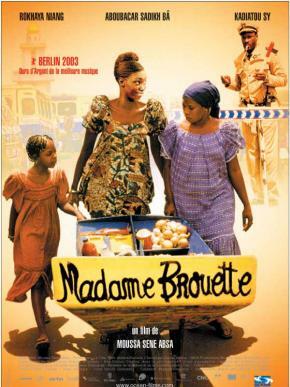 Madame Brouette, directed by Moussa Sene Absa, 2002. The layered portraits of women in the works of the Senegalese director Djibril Diop Mambety deserve their own mention. Abandoning the socio-political slant endemic to many directors, Mambety works to characterize women in terms of their problems, dreams, and ambitions. Anta, with her dreams of emigrating to Europe in Touki-Bouki (1974), Ramatou in Hyène (1974), and the hope of salvation for the continent embodied in the young girls in the unfinished trilogy Le Franc (1994) and La petite vendeuse de soleil (1999), lead the viewer to question inherited commonplaces about Africa and about the role of women therein. Stories about, of, and with women, resistant to easy categorization, they point the way to a truly subversive African cinema. In the struggle to give authentic voice to women constantly subjugated to the symbolic enterprises of their male peers, female writers and directors from the seventies onward have made great use of the autobiographical. The Senegalese Safi Faye, considered the mother of African cinema, is a paradigmatic case here. Her examination of the feminine collective is at once militant, subjective, and poetic, her style “firmly rooted in the narrative traditions of the people she films, situating her work and gaze centrally within the communities whose voice she prioritizes” (Thackway, 2003: 151). In her films, which blend elements of fiction, documentary, and ethnography, she is present both as witness and agent, and they have a markedly subjective character. In this way, she transcends the objectifying gaze implicit in the cinéma vérité techniques of her mentor Jean Rouch. By the inclusion of personal letters and songs related to her personal history, Faye offers an image of the woman as subject, physically and temporally dynamic (Kaddu Beykat (1975) and Fad’jal (1979). 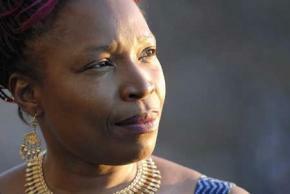 In the 1990s, the lawyer and activist Anne-Laure Folly (Togo) established herself as a director of critical social documentaries focusing on women. Femmes aux yeux ouverts (1994), in which the female subjects look the spectator directly in the eye, is a provocative response to the accustomed occidental tendency to objectify black bodies. If here, the authority ceded to the female witnesses and their words represents an authentic female presence, it is too compromised by the classical mode of presentation to be considered a truly oppositional cinema. Folly goes further in Les Oubliées (1996): her voice-over, highly subjective, displaces the implicit neutrality of the traditional documentary, the position of power it suggests, and in this way, perhaps, its very raison d’être. The recuperation of female subjectivity lies also at the center of the series of short films released over the past two decades by Burkina Faso’s Fanta Regina Nacro. Characteristic of her style is the employment of strategies derived from oral narrative in the examination of contemporary situations. Examining the conflict between the traditional and the modern and the role of women in national identity, they evince overt pedagogic intentions free of the condescension normally endemic to didactic art. Her consideration of arranged marriage, prostitution, and survival in African cities is imbued with appeals for feminine solidarity that reach their apogee in 2004’s La Nuit de la Vérité, a symbolic tale of ethnic reconciliation. Similar strain are evident in the work of Sarah Maldoror, whose career now spans nearly five decades and whose Sambizaga (1972), an account of Angola’s war for independence, won official recognition in both Carthage and Berlin. Searching for a defining principle of African cinema in the 90s, the American critic Mbye Cham states: “The evolution of southern Africa, the politics of cinema in the new South Africa, co-productions taking place among various countries, the search for new themes… These are a few of the opportunities of African cinema” (1998: 124). In the absence of unified policies of production and distribution throughout the continent, present-day works continue to be characterized by a “mixing of genres and formats, a diversity of lengths, and a reliance on documentary” (Coletti, 2001: 194). If it is the case that within these confines, women have tested the boundaries of African cinema, their transition from documentary and the autobiographical into full-length fictional features remains of the greatest importance. In addition to the films previously mentioned, Wanjiru Kinyanjui’s The Battle of Sacred Tree (1995) is exemplary: the story of a free spirit—not a vaunted heroine or timeless goddess, but a brave feminist who transgresses social conventions, abandoning her abusive husband—is characteristic of a growing tendency to present the conflicts faced by contemporary African women in a fictional idiom. Humor, melodrama, feminine complicity in both its generous and self-serving aspects, as well as Islam, Christianity, and native traditions are presented in a manner both fluid and attentive. It is this receptivity toward new themes, and a consequent liberation of female perspectives to encompass not only the feminine, but the world as a whole, that characterizes women’s film production in Africa in the twenty-first century; a concomitant process has been the revaluation of traditionally minor genres such as melodrama, telefilms, musicals, comic, and soap operas—integral aspects of a popular urban culture in which the African imaginary is increasingly dominated by online music video and Nigeria’s rampantly successful video/film industry. Pumzi, directed by Wanuri Kahiu, 2010.The “cultural cross-pollination, the self-conscious appropriation of the occidental idiom and the hybridization of diverse artistic forms” (Coletti, 2001: 195) evident at the end of the previous century have continued to grow in the past ten years, giving rise to such works as Wanuri Kahiu’s science fiction short Pumzi (Kenya, 2010), Jenna Basso’s incisive and personal vision of Zimbabwe at the hands of Robert Mugabe’s notorious 5th brigade The Tunnel (2010), and the Tunisian Raja Amari’s full-length Dohawa (2009), a story of violent and unclassifiable female bodies, locked in a claustrophobic interchange of screams and sighs—a kind of film that years ago could scarcely have been imagined. We are witness here to a revolution in narrative strategies that employs previously underrated popular genres to create artworks of great quality, transmitting their messages in an authentically African language. 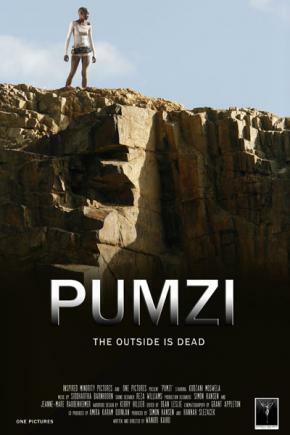 In closing, we should devote special attention to Pumzi, the short film directed by the Kenyan Wanuri Kanhiu after 2008’s successful From a Whisper. A loose adaptation of Logan’s Run, it offers a plea for help from a continent in the stranglehold of ecological devastation and the seed (literally and metaphorically) of a future in which women and ecological awareness rescue the planet from extinction. The film is in no way hampered by the limited resources with which it was produced—the acting is captivating, and the brilliant repertory of audiovisual techniques employed reveal a director of broad culture and initiative and free of ideological and esthetic compromises. The variety of techniques and approaches to film in use in the present day impedes overarching judgments. Women’s increasing esteem and importance within the world of cinema has led to a diversity of intentions and perspectives; moreover, the character of global culture is such that the lines separating Africa from the West are no longer so clear as before. In their fertile imaginary, encompassing a nameless desert in post-apocalyptic Africa, a claustrophobic mansion in Tunis, a barrio in Youpougon, through the subversive possibilities of satire, of musical, of the personal essay in film, women are forming part of the movement of Afropolitanism2 proposed by the Cameroonian philosopher Achille Mbembe, which conceives of the inauguration of a new African civil society, stripped of essentialisms, hidden inferiorities, and patron-client vassalage, where the artist goes hand-in-hand with the statesman. arensburg, Guadalupe, Cinematografías de África. Un encuentro con sus protagonistas, Las palmas de Gran Canaria: Casa África, 2010.
armes, Roy, African Filmmaking. North and South of the Sahara, Bloomington and Indianapolis: Indiana University Press, 2006.
beyala, Calixthe, Lettre d’un Africaine à ses soeurs occidentales, Paris: Spengler, 1995.
cazenave, Odile, Femmes rebelles. Naissance d’un Nouveau roman africain au féminin, Paris: L’Harmattan, 1996.
coletti, Maria, Di diaspro e di corillo. L’immagine della donna nel cinema dell’Africa nera francofona, Roma: Biblioteca Bianco & Nero, Fondazione Scuola Nazionale di Cinema, 2001.
cham, Mbye, “Some reflections on African cinema in the 90´s, Ecrans d’Afrique, 24, 2nd Trimester 1998.
diawara, Manthia, African Cinema. Politics & Culture, Bloomington and Indianapolis: Indiana University Press, 1992.
diawara, Manthia, African Cinema. New Forms of Aesthetics and Politics, Munich, Berlin, London, and New York: Prestel, 2010.
ellerson, Beti, Sisters of the Screen. Women of Africa on Film, Video and Television, Trenton and Eritrea: Africa World Press, 2000.
foster, Gwendolyn A., Women Filmmakers of the AFrican & Asian Diaspora. Decolonizing the Gaze, Locating Subjectivity, Carbondale and Edwardsville: Southern Illinois University Press, 1996.
givanni, June (ed. ), Symbolic Narratives/African Cinema. Audiences, Theory and the Moving Image, London: BFI, 2001.
harrow, Kenneth (ed. ), African Cinema. Post-Colonial and Feminist Readings, Trenton and Eritrea: Africa World Press, 1999. Hernández, José Luis y Laura Sánchez (coords. ), Historia y Utopía. Estudios y Reflexiones, Salamanca, AJHIS, 2011.
mbembe, Achille, De la poscolonie: essai sur l’imagination politique dans l’Afrique contemporaine, Paris : Karthala, 2000.
meleiro, Alessandra (org. ), Cinema no mundo: África (vol. 1), Escrituras, Sao Paulo, 2007.
murphy, David and Patrick Williams, Postcolonial African Cinema. Ten directors, Manchester: Manchester University Press, 2007.
pfaff, Françoise (ed. ), Focus on African Films, Bloomington and Indianapolis: Indiana University Press, 2004.
sohat, Ella, “Culture impériale et différence sexuelle: pour une ehtnographie féministe du cinéma”, CinémActiona, 67, 1993.
thackway, Melissa, Africa Shoots Back. Alternative Perspectives in Sub-Saharan Francophone African Cinema, Bloomington and Oxford: Indiana University Press and James Currey, 2003.
ukadike, N. Frank, Questioning African Cinema. Conversations with Filmmakers, Minneapolis: University of Minnesota Press, 2002. 1. There are two noteworthy exceptions: Burkina Faso, whose government has given strong support to the arts and culture throughout the years, and Nigeria, thanks to the complex phenomenon of video production known as Nollywood. 2. For a deeper examination of the possible ramifications of Mbebe’s thought in the realm of cinema, consult the present author’s article in the following: “El papel del artista africano actual en la construcción del discurso utópico”, en José Luis Hernández Huerta; Laura Sánchez Blanco, Laura (coords. ), Historia y Utopía. Estudios y Reflexiones, Salamanca, AJHIS, 2011.